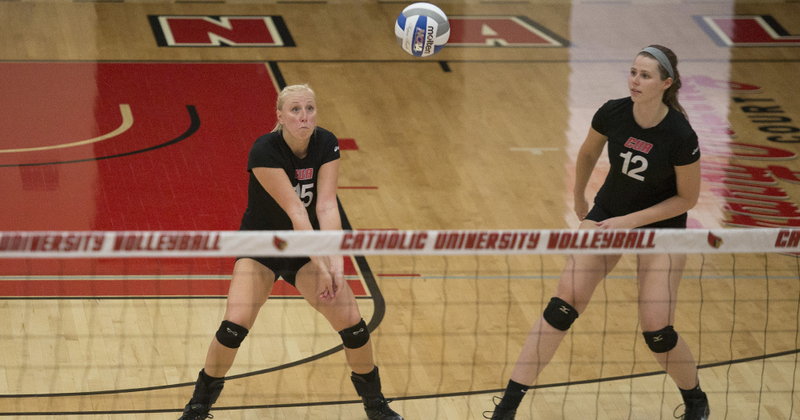 With its fourth win in the past five competitions, the Catholic University of America’s volleyball team brought its record back to .500 at 14-14. The Lady Cards had a clean sweep over the Hornets of Shenandoah University, advancing their home record to 6-2 on the year. The team was rolling offensively, with three members posting 11 kills or more. Senior hitter Brynn Cooley lead the game with 12 kills and added 8 digs, 2 aces, an assist, and a block to her stat line by the end of the night. Cooley was joined by fellow senior Amy O’Connor who posted 11 kills and a game-high 5 blocks. In addition to the senior leadership, the rookies on the team also posted impressive numbers in the win. Freshman Patricia Martinez tied O’Connor with 11 kills, but posted a double-double with her 12 digs. Classmate setter Maria Gonzalez also recorded a double-double on the night by assisting on 37 of the Bird’s 47 kills, and notched 14 digs and 3 aces on the night. The Cardinals have had a tough showing in the Landmark Conference this year, with only a 1-3 record in Landmark play. Fortunately for the Birds, the top 3 teams are all tied at 4-0, leaving the team tied for the fourth and final spot with Moravian. The two squads will face off in the final Landmark weekend next week and the Cards will have to win out to secure the playoff spot. Cooley, an outside hitter from Athens, Ohio commented on the pressure. The Cardinals will be heading into its final invitational of the season, as they travel to Wilkes-Barre, Pennsylvania for the Wilkes Invitational. There they will face off against Wilkes, Morrisville State, and Kean over Friday and Saturday. The following Wednesday, October 25th will be the last home game of the season, and the team will honor its 7 seniors before the match. O’Connor summarized what all of the players will be feeling before their last match on Franny Murray Court.